This paper examines security challenges and economy of the Nigerian state from 2007 to 2011. The paper seeks to find out the extent to which the internal security problems have adversely impacted on the Nigerian economy within the above period. The study adopts the Democratic Peace Thesis and Relative Deprivation Theories as framework of analysis. Secondary data was mostly used in the study largely due to the nature of the research problem. The result of the investigation reveals that the security challenges in Nigeria have long historical antecedence and traceable to bad governance. 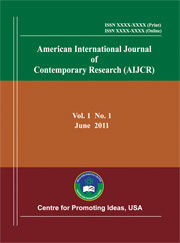 The paper argues that the abysmal failure of successive administrations in Nigeria to address challenges such as poverty, unemployment and inequitable distribution of wealth among ethnic nationalities, ultimately resulted to anger, agitation and violent crimes against the Nigerian state by some individuals and groups. Such crimes include militancy, kidnapping, bombing, armed robbery, vandalisation of government properties, among others. The paper further argues that the activities of various militia groups consequently resulted in low income of government from oil revenue, low GDP rate, low participation of local and foreign investors in economic development, insecurity of lives and property of the citizens, among others. The study recommends the formulation and effective implementation of policies and programmes capable of addressing the root causes of insecurity in Nigeria, such as poverty; unemployment, environmental degradation, injustice, among others.